Some impressions of my travels to Nepal, where I mainly stayed in Boudhanath, near the great Stupa, in the Kathmandu valley. 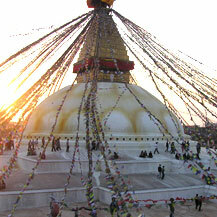 Boudhanath can be described as a Tibetan village. A beautiful atmosphere where the Tibetans walk the ‘kora’ (a Tibetan word for circumambulation) around the Stupa twice a day (early morning and at night) while turning their prayer wheels and reciting the mantra ‘Om Mani Padme Hum’. 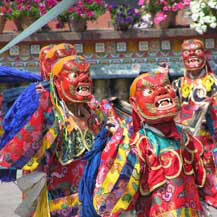 At Shechen Monastery was a big festival where monks performed the typical ‘Cham’ Lama Dances. 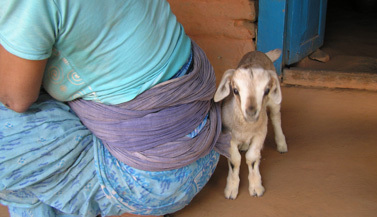 On a trekking in the Himalayan mountains I saw this little goat hiding behind this farmer’s woman… so sweet! 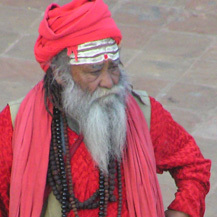 And I was impressed by the beautiful looks of the sadhus (‘holy men’) who are wandering all over Nepal. 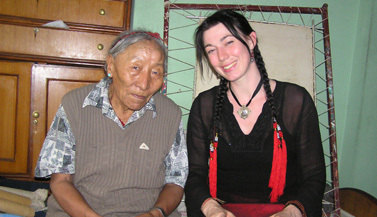 In 2006 I was privileged to meet my thangka teacher Andy Weber’s teacher Targye-la, at his house in Boudhanath. 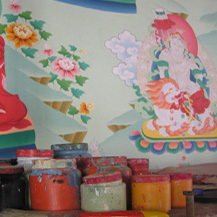 Thargey comes from a family lineage of seven generations of thangka painters. 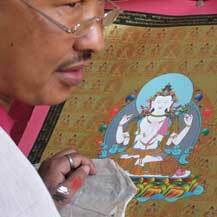 My teacher spent many years in Targye’s presence in the early seventies to learn the art of Tibetan Thangka painting. 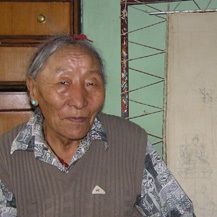 Targye unfortunately passed away in January 2014, but his students and their students (such as I) will continue to pass on this special thangka lineage. In Nepal I visited many holy Buddhist places, like Padmasambhava‘s meditation cave, the Vajrayogini temple and Green Tara cave in the Kathmandu valley and the Swayambhunath Stupa in Kathmandu itself. 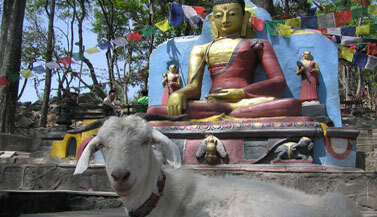 When I was sitting at the bottom of the Swayambhu Stupa a lovely goat came to join me. 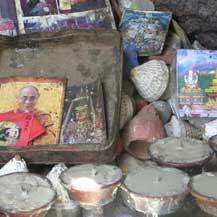 Of course I met a lot of thangka painters too. 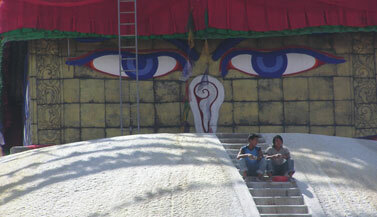 This master painter, who’s now painting in the face of this amazing Four-Armed Avalokiteshvara (Tib. 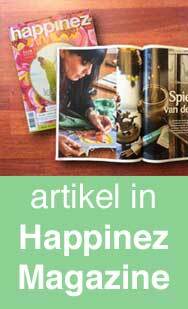 : Chenrezig) thangka. 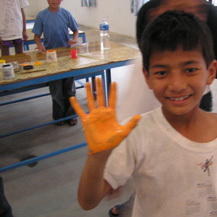 These pictures were taken in a new children’s home in Boudhanath where I spent some days. The whole building was brand new with nothing on the wall and therefore very boring for the children. 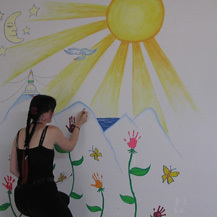 I thought it would be a nice idea to decorate it, together with the children, so they would feel more at home. I designed a painting with flowers made from the hand prints of all children, so they literally left their marks on the walls in their teaching hall. 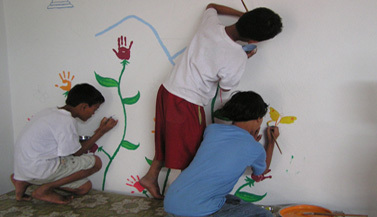 The idea was for the painting to grow, and new children would add their own flowers to feel more at home.